The Jardí Botànic Històric (Historic Botanical Garden), a tiny gem among the gardens of Barcelona, nestles in the hollows of two disused quarry pits in the Foixarda sector of Montjuïc, behind the Museu Nacional d’Art de Catalunya (National Art Museum of Catalonia, MNAC). Because it is enclosed by steep slopes and situated on Montjuïc’s shady side, cold air accumulates at its lowest levels. As a result, temperatures can be up to four degrees colder at the bottom than in the upper areas of the garden. This favours the growth of Euro-Siberian plant species typical of colder climates. L1 and L3 to Plaça Espanya. In Avinguda Maria Cristina, take the escalator up to the Museu Nacional d’Art de Catalunya (MNAC). The entrance to the Garden is behind the MNAC car park, between the escalators that go around the monument to Francesc Ferrer i Guàrdia. The entrance to the Garden by car is through Avinguda dels Muntanyans, behind the MNAC car park. November, December and January, Monday to Sunday, from 10 to 18h. February, March, Monday to Sunday, from 10 to 18h. April, May, September and October: Monday to Sunday, from 10 to 19h. June, July and August: Monday to Sunday, from 10 to 20h. Note: last admission half an hour before closing time. The 1929 International Exposition provided the first major opportunity to tackle the challenge of integrating Mount Montjuïc into Barcelona’s urban fabric. The plan was to transform the mountain into a large urban park – the second in the city after Ciutadella Park – large enough to house Catalonia’s main recreational and cultural facilities. Preparations for the Exposition led to the construction of several of the most outstanding gardens that now form part of the city’s green heritage. Barcelona International Exposition. Aerial view of the installation of the ramaders del Regne. Photograph: Arxiu Fotogràfic de Barcelona. The politician Francesc Cambó commissioned J. C. N. Forestier to design the gardens around the Exposition buildings. Forestier exercised considerable influence on gardening in Barcelona, and to him we owe the design of some of the city’s finest gardens, as well as the introduction of numerous new plant species – particularly such species as Rosewood (Tipuana tipu), the Mmbú (Phytolacca dioica), the Jacaranda (Jacaranda ovalifolia) and the Brazilian Coral Tree (Erythrina falcata) and the establishment, through his follower, Nicholas M. Rubió i Tudurí, of a prestigious college of horticulture and landscape architecture. As part of preparations for the Expo, Pius Font i Quer was commissioned to build a botanical garden. In 1930, with more determination than money, Font i Quer began to assemble a remarkable collection of endemic and rare plants, mainly originating from the Iberian peninsula, the Balearic Islands and Morocco. 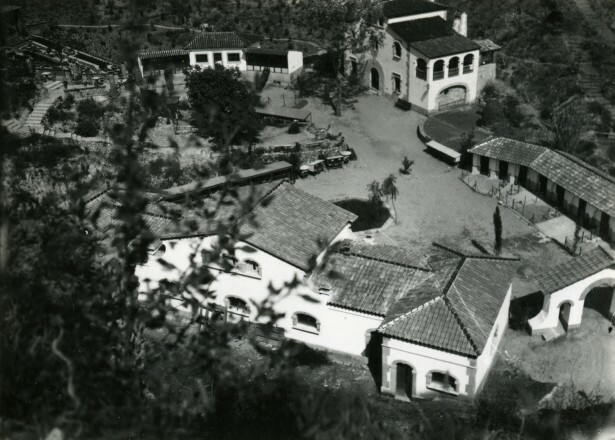 In 1940, Antoni de Bolòs took over as director of the Botanical Garden, introducing new collections of plants from the Pyrenees and the Balearic Islands. In the same year, the Institut Botànic was transferred to the Garden. Thanks to the work of Font i Quer and the Municipal Board of Natural Science Museums, the Institut Botànic now boasted the most outstanding herbaria and the best specialist botanical library in Catalonia. The Historic Botanical Garden was officially opened to the public on 17 July 1941. Despite all the difficulties encountered at the time, some of the rarest plants from North Africa and Spain were successfully grown there. Thanks to the efforts made by the Garden, the perennial Menorca Loosestrife (Lysimachia minoricensis) was saved from extinction. Now grown in many botanic gardens, this species was reintroduced to natural habitats in 1954, the year that Antoni de Bolòs began and announced the first replanting in the Iberian peninsula of a species that was extinct in its natural habitat. In 1986, the need to construct access routes to the new Olympic facilities seriously affected the stability of its vertical walls, and the Garden was closed. Later, restoration and consolidation works were carried out and the Sot de l’Estany sector only was re-opened to the public in October 2003. Since November 2004, Barcelona Metropolitan Area (AMB) has managed maintenance of the whole site. Today, more than seventy years since it was first planted, the Historic Botanic Garden proudly shows the excellent results obtained since it was established: a magnificent display of plant life of the most exceptional size and quality.